Akello at home with her daughter in the Middle of Karuma Hydro Power Project. Photo by Irene Abalo. Many children in Uganda go to school with hope of a better future. But for Topista Aroma, acquiring education is a painstaking endeavour that involves walking for about two kilometers every morning through piles of rocks dumped by trucks from a dam site. “I used to walk with my friends but now I walk alone because they have all shifted. We have no neighbours,” says the 12-year-old Primary Five pupil of Karuma Primary School. 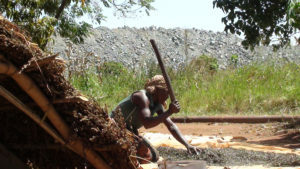 Aromo comes from a home, marooned among piles of rocks dumped by the Karuma Hydro Power Project in Awoo Village, Mutunda sub-county in Kiryandongo district. His father refused to vacate the home because he claims they were not compensated for the land by the Ministry of Energy in charge of compensating the Project Affected Persons. “I cannot go to fetch water alone. I fear animals and the security guards. I move with my mother. I have no friends to play with at home because my brothers and other cousins where taken away because they said this place is bad,” little Aromo adds, as she glances at the pile of rocks behind their home. A Sino Hydro Corporation worker, the company contracted to construct the 600megawatts power in Karuma, passes by dressed in their uniform of orange trousers and reflector jackets. He waves at the family seated under the only mango tree in the compound that measures about 4*5 metres. In the compound sits three huts with two long large water pipes passing through the compound. The Metallic black pipes for transporting water for the construction work was channeled from the river to tank two big tanks with a dam, about 500 meters away from the three huts where 34-year-old Vincent Oloya stays with his family. About 500 meters away, are men dressed in army uniforms with three huge dark brown patrol dogs guarding the boundaries of the project. 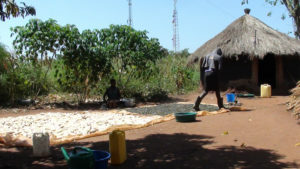 Akello threshing green grams in the compound at their home within the Karuma Hydro Power Project. Photo by Irene Abalo. Oloya, son of the late Christine Apiyo, who died in May 2012 on duty in Gulu at the rank of Assistant Superintendent of Police lives among the pile of rocks and soil about 500 meters away from the boundary. His home sits in the two- and-a-half acre piece of land that he inherited from his mother. “My mother being a police officer was never at home. She left us under the care of our grandmother, Matilda Achola, who is now 95 years old. We are eight children. Others have married and moved on but for me, I have nowhere to go,” Oloya says. In 2011 when the government surveyed and valued land of people affected by the project, Oloya says their land was surveyed but they were only given a Shs3.7 million compensation. “Our plot did not show in the map but we were compensated for property and crops. I refused to vacate because the money was too little for me to relocate my family,” he adds. The money was deposited to the account of his grandmother, Achola on May 4, 2013 who remains named in the Ministry of Energy documents as the owner of the land. 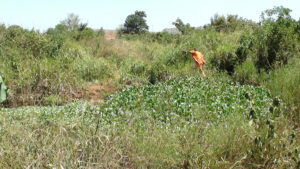 The payment was meant for crops and structures on the land. Oloya, however, says the compensation was not enough to relocate his family of four children, two wives and other dependents. Achola now lives in Kitgum district where she was married before her husband passed on. “Mego could not continue to stay here. She requested us to take her back home when dust from the rocks being ferried on the next plot would fill this place like smoke. She could not sleep at night from the sounds of vehicles and machines at work because these people (Sino Hydro contractors) work day and night,” Oloya narrates. Oloya is the only land owner among about 360 who gave their land in Awoo Village in Mutunda sub-county in Kiryandongo district to pave way for the 600mega watts hydro power construction under the Ministry of Energy. In August 2013, Oloya’s land was surveyed again among 8 others, but there was no feedback from the ministry on the status of compensation for the land. Oloya’s wife Jacqueline Akello, 32, says they were surprised to see their neighbours leaving their homes in the project area one after the other without them being compensated. “People kept leaving one by one until we remained without neighbors. We went to energy office to inquire about our relocation or compensation but to date there is no response. I hear some people are going to Kampala but for us we cannot afford that,” she says. Marooned between heaps of rocks and grown bushes; amidst plantations of maize, cassava and groundnuts, Oloya’s family is staying alone in an area where only wild animals like hippos and elephants frequent. “Here it is difficult to live because monkeys, hippos and elephants come up to the compound because we are near the park, (Part of Murchison Falls National Park),” says Akello. A Sino Hydro Worker Jumps over a small walkway through the deep well dug in Oloya Vincents land about 500 metres from his house. Photo by Irene Abalo. Oloya immediately shows our reporter injuries he sustained on the leg as a result of a recent attack by a hippo as he returned home from an outing. “I suffered to get treatment for this wound because we are not allowed to use bicycles to the clinic in Karuma town. My friend Julius Opiyo would come from his home outside and carry me on his back to a point where I can be put on a bicycle through the short cut,” Oloya explained. It is good to have neighbours. If anything happens to us, no one will help us. We only see police and soldiers moving around. If you don’t have an Identity Card, they can even beat you up,” Akello adds. To get to Oloya’s home, one needs an identity card at the Sino hydro gate before negotiating through corners and the pile of rocks blasted during the creation of the tunnels at the dam. There is no access road though the family uses short cuts that are now being dug into trenches to prevent theft of materials from the project site. Today, he claims he fears for his life and that of his family living alone in the midst of the Shs2.2 billion flagship project that is expected to be complete in December. “I don’t want to keep my family here. It is risky. I want the energy people to compensate me for the land so that I leave. They have not told me even how much they will give me,” Oloya says. Severino Opiyo, the LCI of Karuma, however, told our reporter that Ministry of Energy compensated all land owners affected by the project. “Land owners were all given money only that the money was little to settle some people with their families elsewhere. They are complaining that their land was undervalued,” Severino says. Meanwhile, Cecilia Menya, the Acting Commissioner Electrical Power at the Ministry of Energy told our reporter recently that the ministry is not aware of any family still living within the project area. “That must be a specific case that I must find out why they are still there. But what I know is that there are vulnerable people we are going to physically relocate,” Menya says. 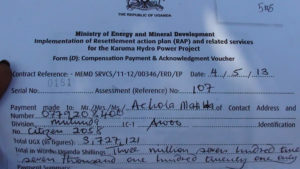 In 2012 government through the ministry of Energy earmarked about Shs4.2 billion for the compensation for paying and resettling people whose livelihoods were affected bu the 600Megawatts Karuma Hydro Power Project. To date, about 100 land owners await relocation while 65 others have taken the ministry to court for under valuation of their land by the government chief valuer and inadequate compensation as their land has already been taken for the project. About 465.52 hectares of land was needed for the flagship project from land owners in Karuma and Awoo villages. Sino Hydro Corporation, the contractor of the $1.7billion project is expected to complete by December 2018 and hand over to Uganda government to manage.